I was driving to the kids school Friday in a really good mood and i rounded this corner and i saw the sun shimmering down on the grass and i just thought "wow the world just glows, it is luminescent" and then i realized the sun was reflecting off of these silkworm threads that literally covered the grass, and a bagworm had completely surrounded this ginormous oak. I hope it doesn't kill the tree. lately, i've been running and the silkworms are dangling from the trees and they get all over me. i'll stop before crossing the major road and had to remove like 10 off of me! i was in barnes & noble with my kids today and i picked up this book "Motherless Daughters" by Hope Edelman and i flipped it open and found some passages that blew my mind. although it is written about women whose moms died, in many ways i feel i was raised without a mother because my mom was emotionally unavailable in my early years and then later my dad won custody (when i was 8) and so i had that sort of gaping loss there. i have read a lot of the psychological literature about the effects of various things happening at various stages of life, and i have the patterns affiliated with a major loss during the very early years. "Self-reliance is perhaps the strongest of the barriers that individuals erect to keep themselves at a distance from others…"
as a very independent person i certainly do this - it's the whole 'i don't need anybody, i don't want anybody, i bought my own house, i pay my own bills, i don't need child support, i am financially independent...' attitude and persona, and yet at the same time there is this deep desire for love, yet i push it away and sabotage things by certain behaviors. i am convinced it is a subconscious way to avoid intimacy. "When a daughter fears loss so much that she believes it inevitable, she avoids forming relationships that might lead to the deep intimacy she craves. This daughter either dodges romance, chooses aloof partners, or extracts herself each time a relationship shows the first sign of long-term commitment. She refuses to make promises or respond to demands, afraid such actions will lead to intimacy that’ll be snatched from her again. She may become proficient at abruptly ending relationships before she has to make an emotional investment, an act that allows her to exercise the control she didn’t have when her mother died." I am giving a talk Apr 4 at 9am at the University of North Texas Literary Symposium "Writing a Wide Land: A Conference on Texas Nature Writing." I'm working on the talk now, and it's titled "Changing the World One Story at a Time." If you live in Texas head to Dallas for the symposium! Details online. I'm working on the talk now with a major amount of writer's block! I know everything I want to say, but getting it all pulled together... that is a bit tougher. I finished an article on The Compact where I had to give up buying new stuff for a month. The piece turned out well. The Compact's Yahoo group - Interesting stuff. I read your New Orleans post and was just reminded at how really dim people are about divorce. It seems like people seem prepared to deal with death and bereavement, but so terribly ill-equipped to handle the idea of divorce. Amazing. It's really like no one understands the profound loss and pain except someone else that went through it. I had relatives that just totally left me alone, figuring that our divorce was messy and sad. So if a divorce is messy and sad, then ... wouldn't you think someone would want moral support? They were all too happy to chatter away when they knew it was a friendly separation, and go on and on and on. You want to smack them on their heads. My father has never uttered the word "divorce" to me, nor ever asked if I was Okay or how I was doing, actually. By not speaking about it, these people around me really implied, in my mind, that it was a failure, something to really be ashamed of. Can we just ignore it and pretend that this didn’t happen? No one's asked about my ex, either, but he's doing pretty well. And I'm happy for him. Ours was an exceptionally amiable parting, which really was helpful. In my case, too, the person, oddly, who was able to offer the most support (in the unemotional way he is able to), was my ex. In the darkest and saddest moments, trying to get to sleep, or steeling myself for a long day ahead in the shower, you feel the weakest. I never once was able to call someone to come over, to just put my head on someone else's shoulder and cry, or get a hug. I was consoling a friend during this time, going through tough times as well, and when I'd call, she'd always assume it was to check on her, but really many times it was to check on me. I'd ask her to come do things, and I feel like she finally got exasperated and said she was doing, fine, thanks, and that she had plenty of distraction and people near to her to help keep her spirits up (in not so many words, but she’s made a point of the empowerment in saying "no"). I'm not sure she considered that I asked her to come along, because I was tired of doing things by myself, and was asking for company for ME. She marvels at how strong and plucky I was, doing things alone. I feel like the world left me little other choice than to do so. She said "No" so many times, I just really got tired of asking. I know it's about expectations .... I'm so sensitive and compassionate, and tend to expect or hope for the same in others, but I pretty much refuse, anymore, to have high expectations with respect to the empathy people have. It's just amazing, the number of people who have to go through life's difficult daily challenges, without others offering them hugs or support. Another blog I read commented on how sad it is to know of far-away friends that had to go in for biopsies – breast, uterine - and had to go alone. Alone? Think about that. Your post, and these others, just made me shake my head. What's wrong with people? Ugh. People could certainly be more open to ask for help, that's true. But, people could also certainly be far more generous in just offering a small gesture of compassion when they know others are hurting, without waiting to be asked. But you know you can get electronic hugs from me anytime, Holtcamp. 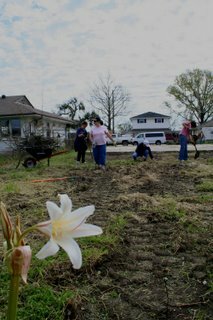 I spent two days in New Orleans working with Camp Restore, a church that is working with community members to help restore homes and yards and neighborhoods. People come from all over the United States to stay at the Prince of Peace church in St. Bernard Parish, which they have renovated into a camp for the “mission workers.” There are bunk beds and showers and a mess hall. Our group of 51 women and 7 or so men from Christ the King Lutheran church in Kingwood arrived Thursday night, and worked all Friday and Saturday. We worked in teams of seven to ten or so, doing different tasks – some painting, some yard cleanup, cleaning up streets and medians and picking up garbage. The first day, I worked along Bundy Street right across from the church. A tan gled growth of weeds and grass had overgrown the neighborhood entryway and trash and limbs that had not been cleaned since Katrina were scattered on the ground. The homes along the road were mostly abandoned, and their lawns had grown up, some to several feet high. The city or county had just started fining homeowners $100 a day if they don’t maintain their lawns… even if they are not there to keep it up! All of the homes were gutted. We cleaned up this area, replanted flowers on the neighborhood sign, and made it look like a place that was alive again. 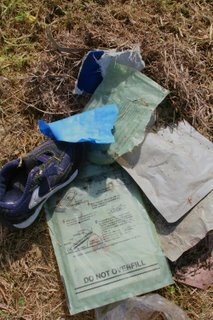 What struck me this first day was finding -- underneath all the overgrown grass and roots -- “Meals Ready to Eat” that had been airdropped to the residents during Katrina. It reminded me of the human side of the tragedy – the reality of these people stuck in their homes with no food, scared, helpless, having lost everything they own, and in some cases dying. 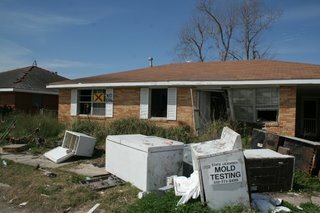 The second day I went with another group to Orleans Parish and some of the really bad neighborhoods near where the levee broke. We cleaned up the yards of two homes and two empty lots where the houses had been razed. One home was in a really bad area, and it was truly astounding the difference we made in the way the yard looked! I have been very reflective during the trip, and tonight and on my 6-mile run this evening I thought about how these pieces of people’s lives were ripped and torn and literally thrown all over the place. Making the neighborhoods and yards look clean and neat brought hope to people. Many people honked when they drove by and gave the thumbs up, and thanked us for caring about their city and their lives. Tonight as I ran, I realized that why I was so drawn to the broken glass and picking up the broken pieces of people’s lives - the garbage - was that was what divorce does. It takes a family and it tears it and rips it and throws the pieces all over the place. My life and my family was torn apart, both my own when I was a child and my family now. It’s been four years, and I’m still recovering from the pain – pain I caused myself, pain I caused Matt, and my children, and pain that I myself endured through various events. I went through the most difficult challenge of my adult life during those years at the beginning. It was a tragedy, and I needed someone to just wrap their arms around me, and to reach out to me and let me know I was loved and forgiven. No one did (at the church), except – of all people – my ex-husband. Now years later I can honestly say I am happier than I’ve ever been in my life, and yet I will always carry a sadness that this happened in my life. I am rebuilding my life, like the people in New Orleans have to rebuild theirs. There is rebirth in tragedy, and the pieces of broken glass and shattered homes can form something beautiful in time and truly give strength to the broken, if you are open to rebuilding and strengthening and taking wisdom from the pain. Coming home tonight in the van, I just thought how much I wished I could have a hug. I wished we women would have hugged goodbye, or that we had hugged at the retreat. I came home to an empty house, and cried a little bit about the sadness and joy and craziness of life. Unlike many women I tend to like alone time and rarely feel lonely. But I will say there are times like these when I could really just use a hug. And just to know that someone cares enough to go out of their way to say so.